This game prototype is my personal exploration on delivering repetitive pleasure with experiencing as little challenge as possible. When players mine with each click, the income increases so further investment can be made to upgrade the sensor (view range), prospector (mining range) and accelerate the growth of mines.The mines automatically grow after being mined, even if it is empty(grey). Also, I tried to apply the typical freemium monetisation strategy here. Mine My Mine from Ni Hu on Vimeo. Melody is a simply notion of a music ludic feature that can be exploited further. By flowing the melody, the player completes the melody by entering simplified notes (without considering inputting intervals larger than an octave or key signatures). Melody intends to bring simple pleasure and challenge to music lovers not by means of “twitch gameplay” (action) but by music cognitions, which attempts the more “melodic” mechanics of music games . Melody from Ni Hu on Vimeo. I can think of a decent library of various genres of music available for a melody game like this. Variations of gameplay can be exploited. Chapter 1 takes place in Edward Dean Adams Power Plant at Niagara Falls. The puzzles in this chapter feature Tesla’s inventions of AC power systems. A room puzzle consists of several contraption puzzles of different types. In order to solve room puzzles and proceed, players sometimes have to solve certain contraption puzzles first. Environment investigation is needed as players can find required puzzle items e.g. cables and Tesla’s written notes as clues in rooms. Audio cues are played in some contraption puzzles to indicate whether the attempt is correct or how close the attempt is to the solution. This type of puzzles requires players to manipulate (using mouse/keyboard combinations or touchscreen flicks) Tesla’s special cables in horizontal and vertical directions to adjust (position and shape) and produce current patterns of the correct electric frequency (horizontal) and potential (vertical) that match the current patterns shown to players. The match rule can vary in different puzzles. This type of puzzle can also be incorporated in larger Device repairing/operating puzzles. This type of puzzles requires players to repair or operate devices/machines in some simple and simulated ways. The procedures vary in different puzzles. This type of puzzles requires players to manipulate switches in the wiring system to achieve different purposes. By powering Lamps, parts of the room will be lit up so more environmental clues can be discovered easily. Other environmental and contraption puzzles. Colour White represents bright AC lamp light. The default states in all Device operation and Wiring puzzles are as shown in the sketches. The room puzzle is the tutorial of the game and players are encouraged by Tesla’s notes found in the room to solve the puzzles. The cables (with limited lengths) needed in solving the puzzles are hidden in cabinets and drawers across the room, and some extra ones may be taken to the next rooms. The Sluice in the room can provide additional water to drive the AC Generator, which can generate more power which is needed in the Diorama puzzle. 5. Connect the two cables from the AC Generator to a nearby AC Socket. 7. Solve the Diorama puzzle. 2. Key to the exit door is revealed. This puzzle serves as a tutorial of this type of puzzles and thus manipulation of cable in horizontal direction is disabled. Match the blue pattern using a cable connected to the red terminal on the DC Generator. The match rule is vertical inversion. This puzzle serves as a tutorial of this type of puzzles and this time manipulation of cable in horizontal direction is enabled. Match the purple pattern using cables connected to the red terminals on the AC Generator. The match rule is horizontal inversion. This puzzle requires players to power the diorama by connecting cables from AC/DC Sockets to its three terminals. Players may refer to the patterns on the AC and DC Generators. Reward: Key to the exit door is revealed. 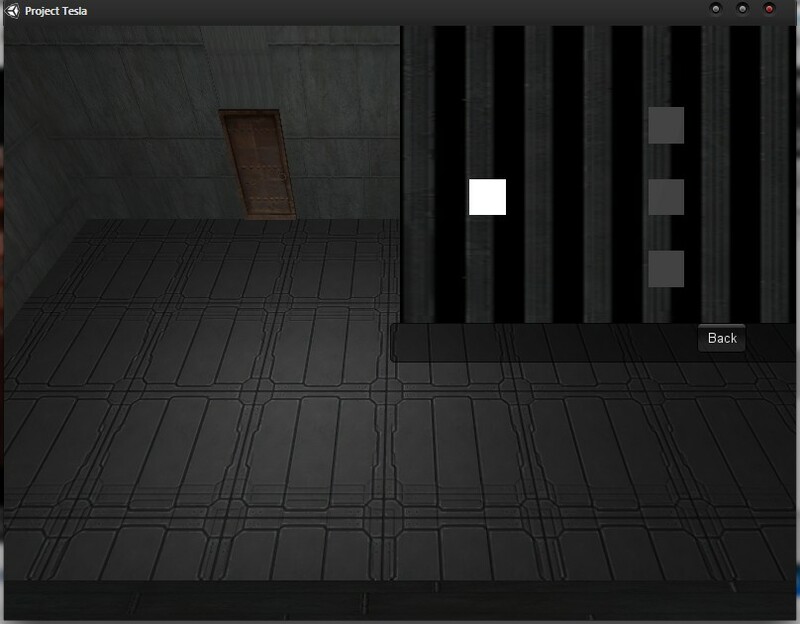 The room puzzle requires players to power the Power Transmission at the Elevator to exit the room. Trick: Through careful investigation players will find out that there is no DC Socket near the Power Transmission so this puzzle can be solved only when the AC Motor puzzle is solved and the AC Motor is used at the Power Transmission. 7. Turn on Power Transmission and the Exit Gate opens. 1. 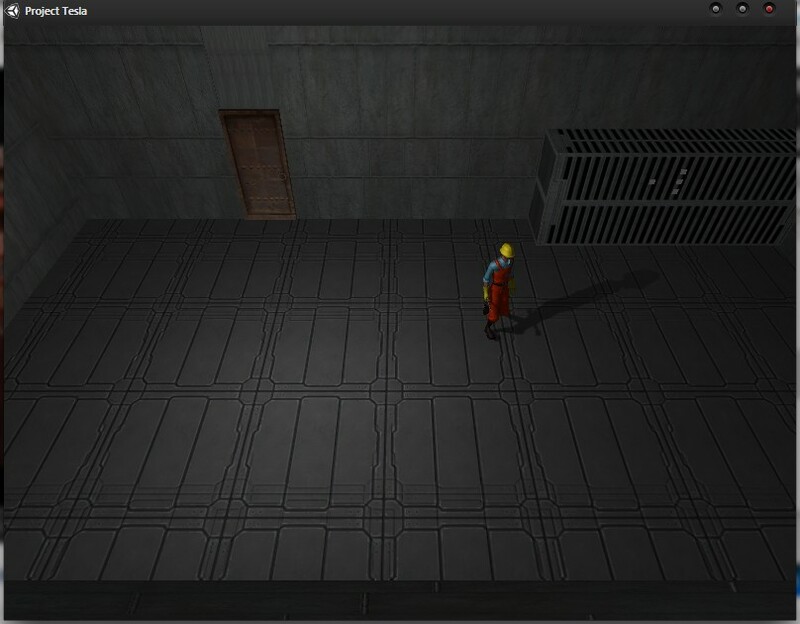 The Elevator is powered to transport players to the next room. 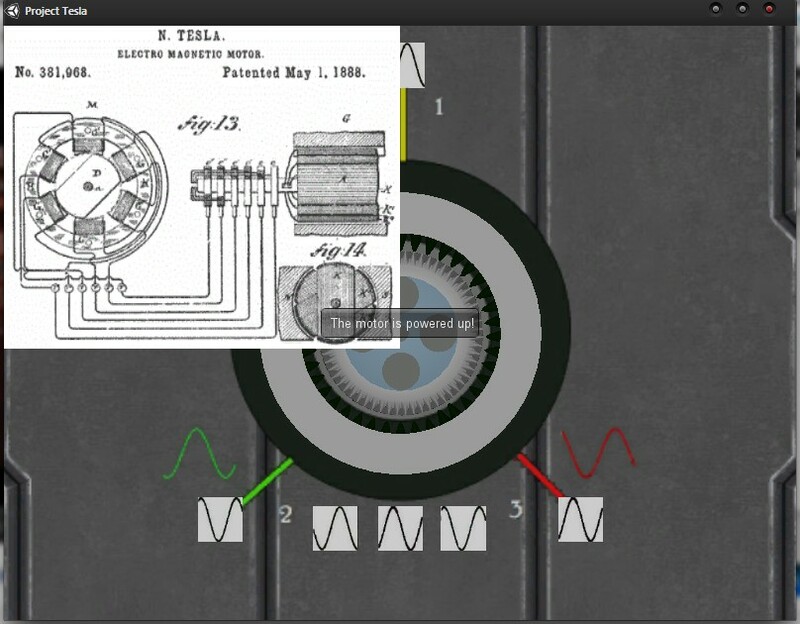 This puzzle features Tesla’s early and most applied invention, AC motor (three-phase). This time the puzzle solving slightly differentiates from the ones of generators, which requires players to memorise the patterns on the motor and match the patterns using cables at an AC Socket without looking at the original patterns. Finally players need to connect the cables to the corresponding terminals on the AC Motor. The match rule is vertical inversion. The match of pattern no.1 is already given. The puzzle requires the player to rearrange the tracks by rotating each track by operating the Track Controller. Form a route from the AC Motor to Power Transmission. One possible route is shown in the sketch. Form a route From AC Power Source to the AC Socket near Power Transmission. In this room, players have to gain two accesses to proceed. One is the Tesla Coil Prototype discharging electricity at the Exit Gate, which is already powered by a relative low voltage AC power (this power cannot be cut and is running through a Transformer) that needs to be transformed to a much higher voltage in order to be passed safely. The other is the Exit Gate itself which is already connected with the AC Motor (it needs AC power from the AC Generator), which is not enough because the power output of the AC Motor is too high that the Exit Gate will open and close repeatedly at a very fast speed for players to pass. Thus players have to consider the usage of the Regulator. There are no Lamps in this room so players can only explore the room environment using their flashlights. Solve the two contraption puzzles in any order. 1. The Exit Gate is clear and open and close at a slow speed so players can pass. The puzzle incorporates Electric potential/frequency matching puzzle element and at this time, player can choose to use their own original pattern at the AC Generator and match rule. But still they have to consider how to connect the cables in order to both power and regulate the AC Motor. After the puzzle is solved, the power output level of the AC Motor can be adjusted using the Regulator’s handle. Solution: One possible solution is shown in the sketch. 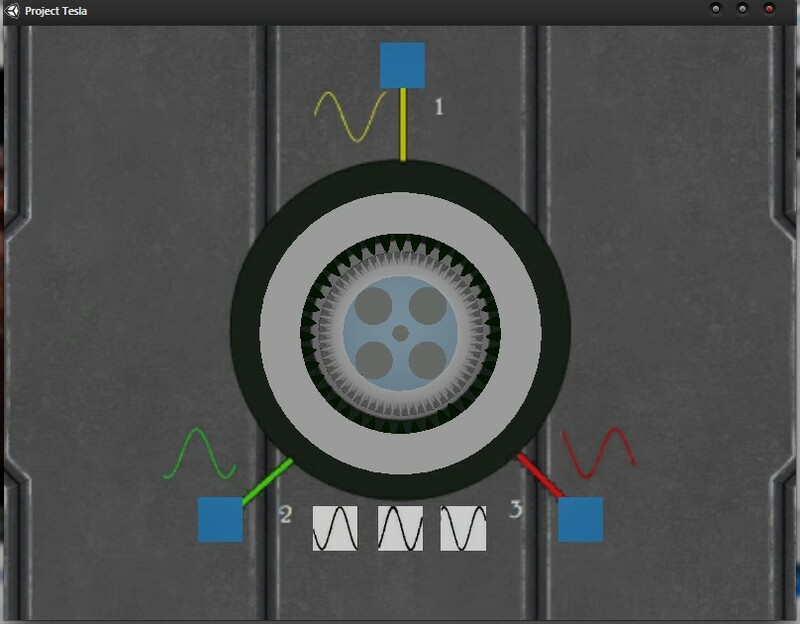 The puzzle requires players to adjust the number of turns of the primary and secondary coils. Tesla’s note explains the basic principles of transformers and implies how high the voltage is needed in order to pass the Tesla Coil Prototype safely. The original idea of “first person actor” was abandoned for its practicality for a small development team and limited budget. The project then turned to the idea of a FBI agent’s detective discovery of Nikola Tesla’s life and work. To demonstrate the possible game mechanics of the game, which are supposed to be related to the Tesla theme, two puzzled demos were created. The first one is a general acoustic puzzle, which introduces the player to the puzzle mechanics of audio pattern recognition. The player will hear a sequence of electric current sound and three shorter sounds that make up the sequence. The puzzled is solved when the shorter sounds are clicked/tapped in the correct order. Now, the second puzzle takes the pattern recognition further by introducing the visual patterns. 1. Acoustic: By moving the mouse to or tap the central gear and the three boxes with curve patterns, players can hear a sequence of electric current sound and three shorter sounds that make up the sequence respectively. This approach has been introduced to the player in the previous puzzle. 2. Visual: Next to the number marks of the terminals there are three coloured curve patterns (representing the wave form) and each of them is a complementary vertical inversion to a curve patterns on the box. Players can click/tap on a box to choose a cable of AC power source and then click/tap again on a terminal to apply the match. Signal sounds are played to indicate whether the match is right. The puzzle is solved by completing all three matches. When the puzzle is solved, the player can get some related source information about the puzzle as a reward of the Dossier system. Also, since the AC motor is powered up, it functions to interact with other contraptions and becomes part of the whole room puzzle. What if you were the mysterious genius, master of lightning, Nikola Tesla? What would you do to with your inspirations and talents for inventions? Would you be able to realise Tesla’s dream of world wireless power transmission, death ray and even more…as a different Tesla? Core gameplay: The player plays Tesla in his view (with his acute sense of hearing and sight), from his early career on. Role-playing: Put in the historical scenarios, the player may either follow the indicated path of Tesla or make different choices to alternate the history in critical events such as the decision of charging for his AC generator patent. Career simulation: The player has to raise and manage funds for invention projects in which the player also need to balance time and energy between work and social activities. Inventing: The player collect inspirations (represented by graphic symbols) from daily life through puzzles (ref. Myst, Machinarium) and then assembly them in a certain logic way to create a new invention. This process takes time can energy. 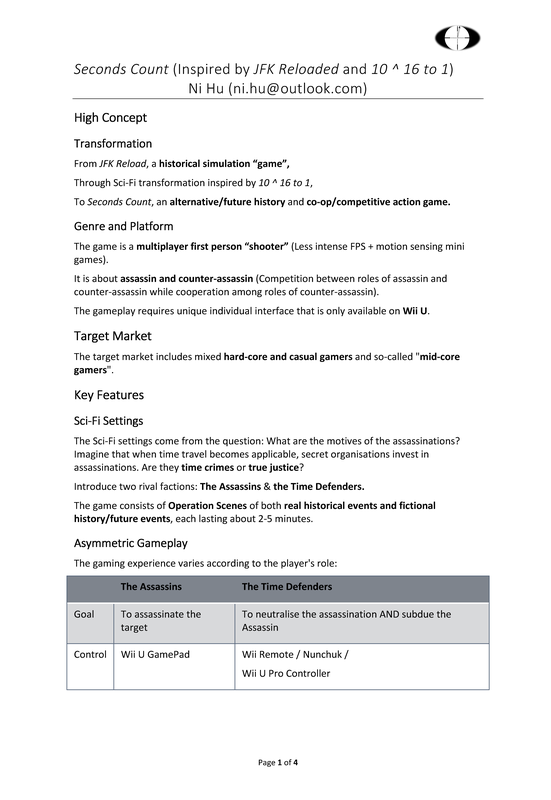 To Seconds Count, an alternative/future history and co-op/competitive action game. The game is a multiplayer first person “shooter” (Less intense FPS + motion sensing mini games). It is about assassin and counter-assassin (Competition between roles of assassin and counter-assassin while cooperation among roles of counter-assassin). The gameplay requires unique individual interface that is only available on Wii U. The target market includes mixed hard-core and casual gamers and so-called “mid-core gamers“. The Sci-Fi settings come from the question: What are the motives of the assassinations? Imagine that when time travel becomes applicable, secret organisations invest in assassinations. Are they time crimes or true justice? Introduce two rival factions: The Assassins & the Time Defenders. The game consists of Operation Scenes of both real historical events and fictional history/future events, each lasting about 2-5 minutes. The game runs on the concept of “seconds count”. To prevent an assassination, the Time Defenders developed a technology that can detect critical events by 5 seconds at most in advance. Thus they have an Operation Window of 5 seconds to take requisite measures before the Assassination Point occurs. The graphics are in cartoonish style in order to ease the violence. The audio includes scene themed music (e.g. 1960’s American music in JFK’s scene) and Sci-Fi sound effects (e.g. sound effects of future weapons). 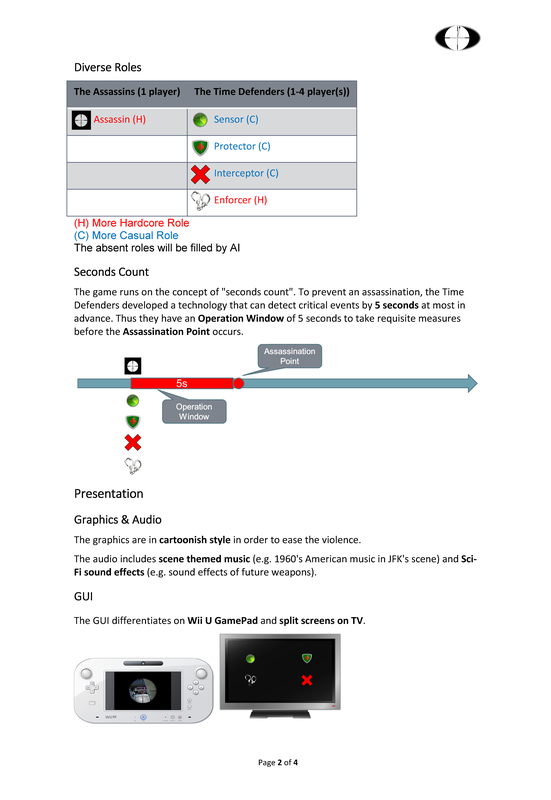 The GUI differentiates on Wii U GamePad and split screens on TV. After operation briefs from their own HQs, two teams start time travel to the operation scene. In this stage, two teams are invisible to each other and the world of the scene. The Assassin has 2-5 minutes (in this scene, just 2 minutes) to choose the assassination spot, prepare the weapon, evasion/self-protection equipment and plan the evasion action. Meanwhile, the Time Defenders should determine the ideal defense positions, just before the Assassin pulls the trigger. The Assassin acts. When the trigger is pulled, the Assassination Point (AP) is created. 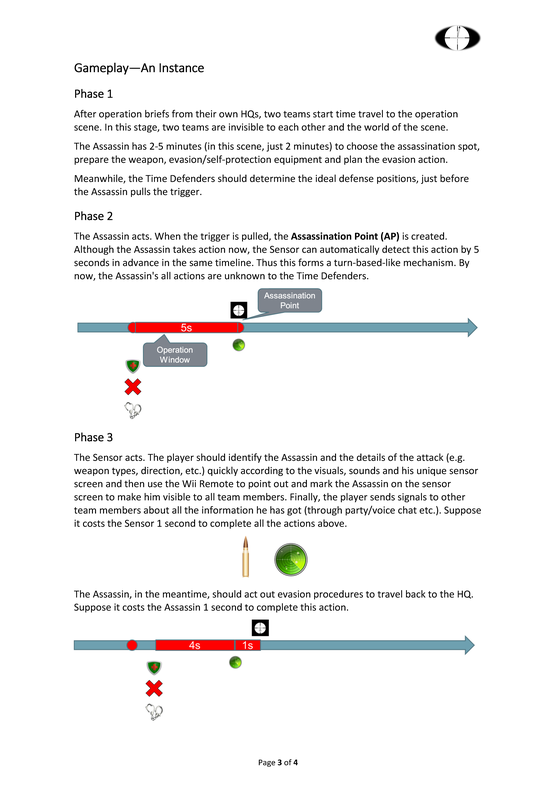 Although the Assassin takes action now, the Sensor can automatically detect this action by 5 seconds in advance in the same timeline. Thus this forms a turn-based-like mechanism. By now, the Assassin’s all actions are unknown to the Time Defenders. The Sensor acts. The player should identify the Assassin and the details of the attack (e.g. weapon types, direction, etc.) quickly according to the visuals, sounds and his unique sensor screen and then use the Wii Remote to point out and mark the Assassin on the sensor screen to make him visible to all team members. Finally, the player sends signals to other team members about all the information he has got (through party/voice chat etc.). Suppose it costs the Sensor 1 second to complete all the actions above. The Assassin, in the meantime, should act out evasion procedures to travel back to the HQ. Suppose it costs the Assassin 1 second to complete this action. Other Time Defenders act simultaneously. 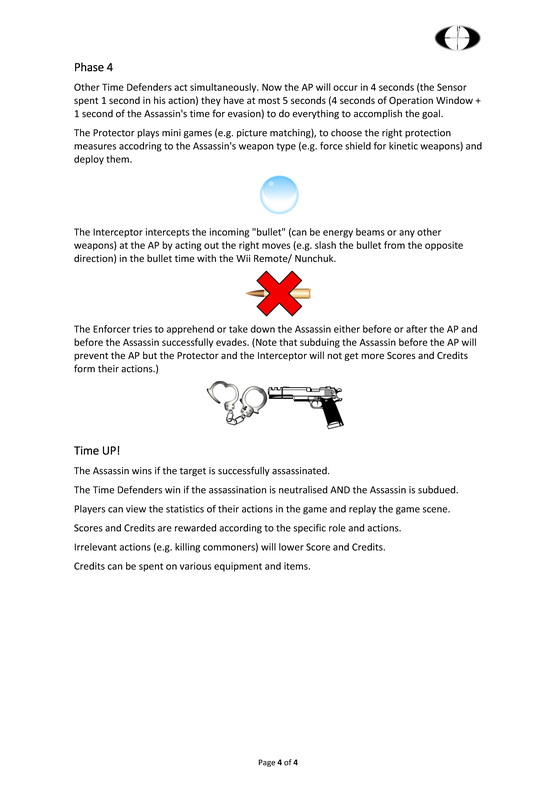 Now the AP will occur in 4 seconds (the Sensor spent 1 second in his action) they have at most 5 seconds (4 seconds of Operation Window + 1 second of the Assassin’s time for evasion) to do everything to accomplish the goal. The Protector plays mini games (e.g. picture matching), to choose the right protection measures accodring to the Assassin’s weapon type (e.g. force shield for kinetic weapons) and deploy them. The Interceptor intercepts the incoming “bullet” (can be energy beams or any other weapons) at the AP by acting out the right moves (e.g. slash the bullet from the opposite direction) in the bullet time with the Wii Remote/ Nunchuk. The Assassin wins if the target is successfully assassinated. The Time Defenders win if the assassination is neutralised AND the Assassin is subdued. Players can view the statistics of their actions in the game and replay the game scene. Scores and Credits are rewarded according to the specific role and actions. Irrelevant actions (e.g. killing commoners) will lower Score and Credits. Credits can be spent on various equipment and items. Biography Kongphan, whose name then was unknown, used to be the young almighty God of Black dwelling in the heaven sphere. His elder brother, the God of White, somehow went through a drastic change of mind and cast him out of heaven for a secret reason in the constant war against the inferno sphere. When he fell to the earth sphere, his being of ego was split into several lesser beings together with his personalities and virtues, scatter across the earth and other worlds. Being only one of the shards, he lost almost all of his divine powers and became a mortal. With both the perplexity and vow of vengeance burning in his heart, Kongphan embarked on a journey for convalescence (rehabilitation) beyond and the answer to the fate of him and his brother. 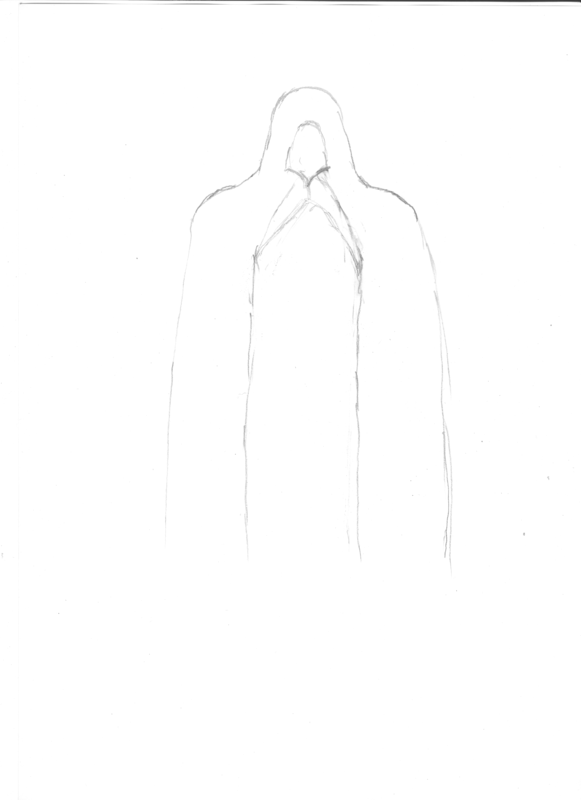 After fall: A young man about 1.73m high wearing a black thick robe with his face always concealed in the shade of the hood. Personality Being mortal, Kongphan appears to be cold and indifferent, but he has a warm heart hidden deeply. He never says too much and always chooses to act on his own. He prefers solitude but also yearns for friendship and others’ affections. In a mortal way, he is truly a perfectionist and a romanticist. Relationship Like pillars in a temple, he is the central one. Befriending with his other lesser beings, he then gets closer to his wholeness. Combat style Depending on the player’s choice, Kongphan will vary in his profession, but always remain in a dark-oriented combat style. Abilities Kongphan is initially deprived of his divine powers. As he convalesces and gets complements from his companions, he will rediscover his lost powers of black and darkness, varying according to his determined profession(s).